What did the Bay Area look like in the Age of Rail? A few years ago, I published a map – really a cartogram – showing the service patterns of Marin’s old Interurban system, the light rail that covered all of Central and Southern Marin. Now, I’m starting on something a bit bigger: what did the Bay Area’s rail network look like in 1937? The Interurban map was motivated out of a sense of confusion about the system. Maps of the time just showed where rails went and what stations were along them, similar to road maps, but contemporary transit maps are different. Rather than showing the rail network, they show the service network – how trains move along the rails. The resulting map lifted the fog from the system. Rather than just a musty map, I could see how someone could actually get around Marin on the Interurban. This new project comes from a similar motivation. I’ve seen old maps of the Bay Area, like the one below, but they don’t give a good picture of what goes where and when. Sometimes they leave out or demote rival rail companies. Sometimes they are too low-resolution to show how different lines split off. And they never show how frequently service runs. So far, thanks to a kind Twitter follower, I’ve obtained a 1,500-page scan of the 1937 rail guide, learned how to read the thing, and started to wrap my head around the Oakland lynchpin of the system. I’ve also determined that I won’t map local-service railroads, like Muni, the Key System or the Interurban. A regional street map doesn’t show local streets, after all, and focuses instead on the freeways. This map will focus on the “freeways” of the regional rail system – the fast, intercity service. Still undetermined is how much to show. Do I show frequency? It varied wildly: while Western Pacific’s Scenic Limited only left once per day, Southern Pacific ran hourly commuter service between San Jose and San Francisco. Do I show the hierarchy of stations? Palo Alto is a major stop on the Peninsula, while Lawrence was frequently skipped on the same line. 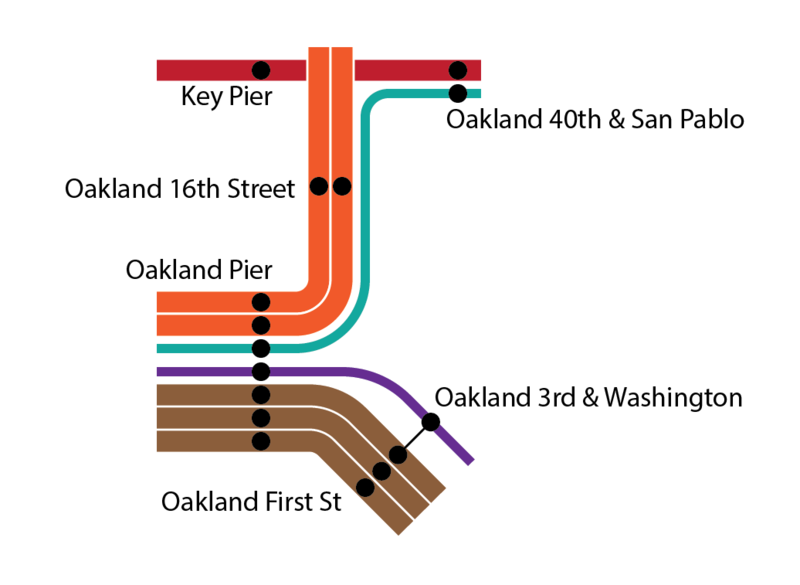 My progress so far is fairly limited, but I’m using Oakland – the most complex part of the system – to try out variations on stop design, font, colors, and how to differentiate service styles. Stay tuned for updates. 9 Responses to What did the Bay Area look like in the Age of Rail? Hate to interrupt your 19th (sorry I meant to say 18th) century nostalgic dreaming. Just draw a big cloud with computer routed and driven electric cars over the map that can take anyone door to door, maximizing occupancy while minimizing congestion and emissions and you should be good. I think you meant to say “20th century” and “curiosity”. Sorry I interrupted your 21st century prognostications. Dave you are quite right about it being 20th and 19th century dreaming. I shall carry on with my contemporary 21st century prognostications. “prognostications”? Don’t you mean delusions? 1) Automation has nothing to do with the motive power of cars and will not automatically lead to reduced emissions. With low gas prices, current market trends are actually diminishing incentives for the purchase of cleaner vehicles. 2) Automation has nothing to do with “maximizing occupancy” either. Vehicle autonomy at a very high tier could actually create incentives to diminish average occupancy. Some cars could be empty, for example. It could also create incentives for cars to get much larger, like a mobile living room, thereby diminishing road capacity. 3) Automation will not reduce congestion unless it can squeeze out the empty space between cars by allowing vehicles to travel extremely close to one another. That requires autonomy to be universal and also sets up the possibility of catastrophic system failure. 4) Even with full and universal autonomy where humans are not allowed any control over their vehicles, major errors would still be present. They would just move from people to sensors, software, algorithms and systems. My 21st century has cyber attacks, software bugs, digital viruses, and server farm fires that could all lead to failures. I guess yours doesn’t. Franz – please stay on topic, per the comment policy. A post on automated vehicles is in the works, but this is not it. Any further off-topic responses will be deleted like normal. For what its worth, I think that these maps are a great idea. Using contemporary iconography to show what transit systems were like in 1937 is, at a minimum, a boon to historical understanding. Also, whether people like Richard like it or not, we are in an age of rail transit expansion and have been for the last couple of decades (and the trend is not abating). BART to San Jose, Oakland Airport Connector, SMART, maybe BART to Livermore, Caltrain Downtown Extension, High Speed Rail, etc are all happening. It’s extremely useful to see how this newly emerging, and increasingly inter-connected, system compares to the older system. As far as the maps go: Do the widths of the lines show frequency? I think showing frequency (with color, line widths, etc) is important. As you mentioned, some of the early 20th century rail services were very infrequent. Not showing that can give the impression of a system that was much more robust than it actually was. I’m trying to figure that out. The real “transit” like the Key System and Muni are below the detail of this map. Instead, I’m trying to differentiate between commuter-service routes (morning and evening service), all-day service, and long-haul. The Brown Lines (Southern Pacific) above fit the first; the Red Line (Sacramento North) and Orange Lines (Southern Pacific) fit the second; and the two thin lines (Santa Fe and Western Pacific) fit the third. The thin lines show the long-haul service; thick lines represent commuter and all-day transit. Hmmm… I could change the commuter to be dashed… well if you have any suggestions for how to display this stuff you know where to find me. Also, I think I’ve settled on a font: DIN, which is used by on LA Metro map. FWIW, I was very wrong about Oakland being the most complex part of the system. North Contra Costa, especially around Pittsburg, was a hot mess. How many of these rail lines still exist today, either in operation for freight or derelict? I wonder if there is enough to add new and useful commuter lines today to east or South Bay without having to incur the cost of buying the land.